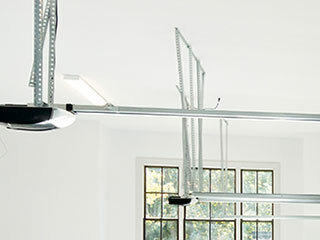 A good garage door opener will keep your system working efficiently and quietly. It should also bring you enhanced security, convenience and safety. An old, worn-out opener is a different story though; it'll likely develop faults over time, and can even make your system unsafe. Our team can repair malfunctioning openers, as well as install new units when necessary. A complex machine such as this can be hard to diagnose. Because faults can occur with the drive unit, the mechanical linkages or within the circuit board itself, there are many different ways an opener can malfunction. Our team has the experience to quickly identify any underlying faults, and can pinpoint any affected areas to help get things sorted. We work with all the major manufacturers, so we can quickly supply replacement parts for any brand; LiftMaster, Genie and Craftsman, to name a few. In addition, our team travels with a full selection of components, ready to install. We may be able to swap out damaged parts on the spot, bringing your opener back to perfect condition as quickly as possible. Few homeowners know how important their opener is, but sometimes there are a whole range of benefits to upgrading; increased security, better reliability and faster, quieter operation. If you’re thinking of investing in a new opener unit, we’re happy to help you. Our team will walk you through everything you need to know to choose the perfect system for your home, and will install it for you to our highest professional standards. There are dozens of different units to choose from, but the first decision to make is the type of drive you’ll need. Essentially, it boils down to what’s most important for you: for the quietest, smoothest movement, choose a belt drive. If you want a low-maintenance opener that keeps noise to a minimum, look at screw drives. For low prices and good durability, chain drive units are the way to go. For help installing a new opener system, or to restore your existing unit to perfect working order, contact Garage Door Repair Forney, TX today.